Sunday provided me with an excellent opportunity to browser art books (Mary Cassatt being the other). Unfortunately, it won’t take too many Sundays to go through the art books I got last weekend. Which will make me sad. Anders Zorn was a Swedish painter and etcher from the end of the 19th century, so roughly contemporary with Mary Cassatt. The book doesn’t mention any interactions, but it does mention that some in the art world compared Zorn to John Singer Sargent, whom Cassatt knew. Zorn managed the Swedish pavilion at the World’s Columbian Exposition in Chicago in 1893, and Cassatt put together a mural for the show. So they moved in similar circles. Look how cultured I am! At any rate, Zorn became better known for his etchings than his paintings, and he did them (as well as paintings) on commission, so he did several presidential portraits as well as portraits of leading industrialists and financiers of the day. 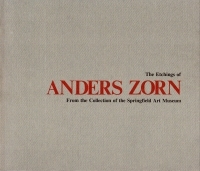 This book collects a large number of them that the Springfield (Missouri) Art Museum received as a donation in the 1970s, which it then cataloged and displayed and sent around as a travelling exhibition. The etchings are well-executed, and I recognize the subjects that I recognize. Etchings and prints like this (and like the ones done by Currier and Ives or Hiroshige were mass media of the day, so they really punched above their weight culturally, as people could see these and buy a copy to take home. Me, I’ll be able to see these prints in person at the local art museum and tell my boys all about it, which will leave them marvelling at how their father knows these things. Or yawning with boredom and a dying hope that maybe I’ll get them something at the gift shop. Regardless, it will have left me with more from a Sunday afternoon than the forgotten score of an unremarkable Redskins-Cowboys game.